Stems: Ascending to erect, branched, sparsely hirsute and strigulose, longer hairs proximal to inflorescence stout, stiff, and retrorse; sap milky. Leaves: Mostly opposite, upper ones occasionally alternate; stipules absent or minute and gland-like; petiole .27 to 1 inch; blade .4 to 4 inches long, .2 to 1.4 inch wide, elliptic to lanceolate, base symmetric, wedge-shaped to tapering to a long point, margins crenate-dentate, tip acute to acuminate or obtuse, lower surface strigose, upper surface sparsely strigose to hirsute. Inflorescences: Cup-shaped receptacles, terminal, subtended by pale green-based bracts or bracts entirely green; peduncle less than 1/25 inch; involucres bell-shaped to cylindric, about .1 inch long, .05 to .08 inch wide, glabrous; gland 1, yellowish green, obconic; appendage absent. Flowers: Staminate flowers 5-8; sepals 0; petals 0; stamen 1. Pistillate flower: sepals 0; petals 0; ovary glabrous or sparsely strigose; style 2-cleft for 3/4-1/2 length. Fruits: Capsules ovoid, 3-lobed, ca. 1/8 inch, glabrous; seeds black to brown or gray, usually strongly mottled, ovoid, unevenly tuberculate; caruncle present. Habitat: Tallgrass, mixed-grass, shortgrass, sand, and sandsage prairies, river and stream banks, flood plains, roadsides, disturbed sites. 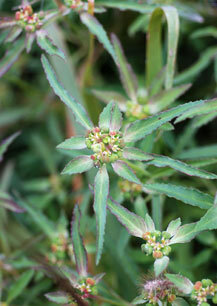 Comments: Euphorbia davidii is named for David L. Anderson, Argentinian who collected the plant.